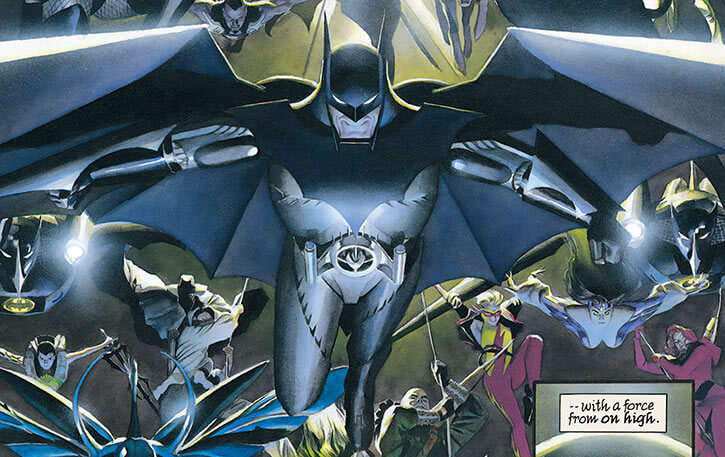 This capsule profile is specifically about the version of Batman (Bruce Wayne) that appears in the landmark Kingdom Come graphic novel. It was mostly intended as DC Heroes RPG stats and additional details for people who have read the story. Published in 1996, Kingdom Come takes place in a possible, dystopian future of the DC Universe. Bruce Wayne of course has no inherent super powers, and his body was ruined from years of abuse. But he is still brilliant and has a large number of technological marvels he can bring to bear. Some time after Superman’s retreat into seclusion, Bruce Wayne was publicly revealed to be Batman. The circumstances surrounding this event are not revealed in Kingdom Come. But this author speculates that it occurred upon the death of R’as Al Ghul. Following this revelation Bane and Two Face destroyed Wayne Manor. The injuries he sustained defeating them combined with the years of abuse of his body forced Bruce to wear a supportive exoskeleton . Without this equipment he would be immobile and helpless. Even such events did not stop Bruce from continuing with his eternal war on crime. He retreated to the Batcave and constructed a number of robots which could keep Gotham safe in his absence. 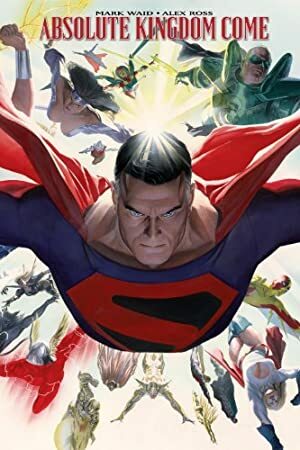 During the events of Kingdom Come, Bruce recruited a number of young heroes (mostly the successors of those Superman had recruited for his Justice League). Their goal was to keep Superman and Wonder Woman’s vision of a metahuman-dominated future from becoming a reality. Bruce helped to shut down Luthor’s Mankind Liberation Front. In the end he brought his forces into the Gulag conflict without clearly taking sides. Following the events of Kingdom Come Bruce turned the Manor into a hospital for the survivors of the Gulag. He also has come to be on good terms with Superman and Diana. Bruce is an old man by the time of Kingdom Come, and he must wear a metallic exoskeleton to function. He remains impeccably dressed and groomed as is proper for a man of his station. Bruce is always best used as an NPC that is always two or three steps ahead of the players. He is incredibly intelligent and competent, and this tends to make him a bit egotistical and arrogant at times. He will assist his friends, or those who he perceives as serving his purposes, but will do little for the sake of someone who does not agree with his ideology. Also, somewhat disconcertingly, he tends to smile a lot and to be much more easy-going than the Batman of today. Area Knowledge (Gotham City), Connoisseur, Expansive Headquarters (Batcave), Genius, Intensive Training, Iron Nerves, Leadership, Lightning Reflexes, Sharp Eye. Gotham City Police Dept (High), Superman, Red Robin, Nightstar, Ibn al Xu‘ffasch (Low before Kingdom Come – High after). Age, Authority Figure (Gotham), CIA to Seeking Justice, Public Identity, Traumatic Flashbacks (Crime Alley). SPINAL HARNESS [/DEX/ 09 /STR/ 05 BODY 09]. BAT ARMOR [/BODY/ 10 Hardened Defenses, /STR/ 07, Claws: 07, Flame Resistance: 06, Flight: 08, Heat Vision: 13, Radio Communication: 13, Sealed Systems: 09, Telescopic Vision: 08, Thermal Vision: 08, 10 AP ABCD Omni-Gadgets (x3)]. Helper(s): Chris Gordon, Eric Padua.